Whether you are a marketing professional, or just plain curious, it’s very helpful to understand different techniques in marketing and the differences between them. 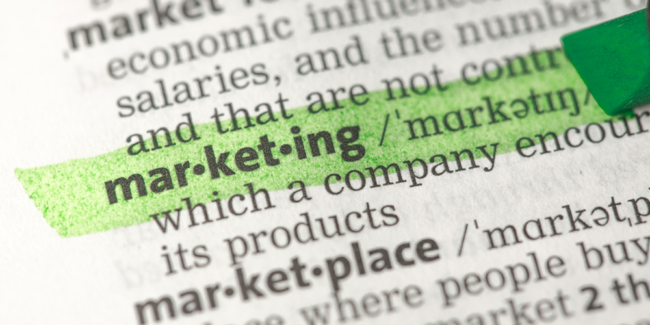 Marketing has existed since the beginning of products and services being sold, and is constantly evolving. There are two main forms of marketing that apply to the majority of marketing professionals, outbound marketing and inbound marketing. Traditionally, marketers relied heavily on outbound marketing techniques in attempt to reach their goals. For example, the first newspaper advertisement was made in 1704. That’s a long way back! But, now, outbound marketing has changed to a degree as well. Radio advertisements have been around since about 1922 and is still being utilized to this day. It’s a smart approach to marketing when you’re able to capitalize on the listener tuning into the sports game, for example. As the radio rapidly became popular in the early 1900s, majority of households would have at least one for their family. In today’s world, radio is still being utilized for outbound marketing techniques while in our cars, handheld devices and households. Another large assist to outbound marketing efforts has been television! The first recorded advertisement was around 1941 during a Dodgers game. The product marketed? A Bulova watch, believe it or not. 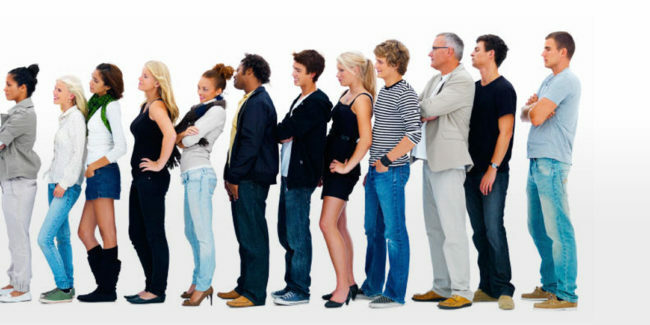 This was a revolutionary marketing technique and opened the doorway to many more like-minded companies trying to reach audiences by the masses. Majority of households to this day have at least one television, and commercials now run throughout the day between movies, television shows, sports games, and more. Right around the same time as televisions hitting the market for households, phone’s were being utilized a lot more for advertising through cold-calls. Inquiring about services that might be needed and so on. This might have been a solid approach back in the day, but in today’s generation, consumers are not a fan of cold-calling. People generally do not like when an unknown number is calling, interrupting their workday, so the odds of a cold-call working are very slim. With today’s latest technology, our cellular devices are customized to our wants and needs, so as a marketing professional, it’s important to learn about your audience. An interesting approach to outbound marketing has been utilizing trade shows for like-minded businesses. Trade shows help businesses market their product or service to other businesses, whether interested or not. It’s a smart way to see who your competitors and how your company hangs with the rest. Are trade shows effective? All depends on you as a marketing professional! Trade shows are a more person-to-person based interaction toward outbound and rely heavily on timing. You might not get the close rate you want, but the leads are definitely there. Soon after computers were available to the consumer in the 90s, emailing became a must-have tool for businesses and consumers alike. The door was now open for businesses to send messages to the masses. This, you could image, would be very annoying because there was no one to regulate how much content you recieve. So, in 2003, our current President at the time issued the Can-Spam Act. This stopped businesses from sending unsolicited emails to consumers without their acceptance. Email is still widely used today and now, people can sign up to newsletters and subscriptions lists to receive the content they want (hint to Inbound). Now, computers are used from almost all marketing professionals. We are currently living in the digital era and will continue to thrive with technology. These are the major forms where outbound marketing thrive. You are attempting to reach your customers through advertising and in-person meetings. This method is still effective and allows creativity as a traditional method of marketing, but it also comes with its downsides as well. The issue with outbound marketing is that you are basically shooting in the dark. Traditional outbound marketing did not focus on targeted customers, but focused more on the masses. This creates a chain reaction of issues, because now, people could get annoyed with the company’s marketing approach, and people could also begin to block unwanted solicitation, creating a more difficult mountain to climb when trying to attract new leads & potential customers. Another problem with outbound marketing is that you aren’t able to track how well your marketing efforts have been, as well as tracking your ROI and bad leads. Being able to track and monitor your efforts will most definitely help provide better insight to something you might have missed, or shed light to what is not working so that you can pivite. A more modern approach to outbound marketing is targeting and personalizing your potential customers. This should be a technique all marketing professionals apply, whether outbound or inbound. When you do your research, and begin to build a list, you’re one step closer to attaining a potential customer through outbound efforts. For example, when you go to a trade show, you are literally in the same vicinity of other like-minded professionals and potential customers, ready to be engaged. The modern approach to outbound can be effective, depending the situation and customer you are interacting with, but it’s only one piece of the puzzle. Emailing through the masses almost never works. As we mentioned above, now that there is an act in place to stop spam emailing and unwanted solicitation, businesses have to revert to opt-in emailing. When website visitors opt-in to your emailing service, whether be a newsletter or something else, they are literally giving you permission to send them more information. 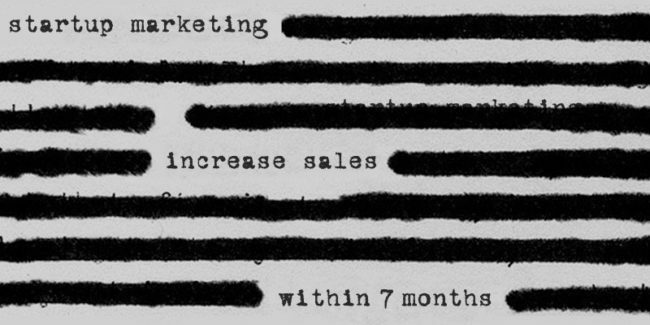 This is exactly what you want as a marketing professional. This starts the relationship between the potential lead and the company, and overall is a much better approach to email marketing. 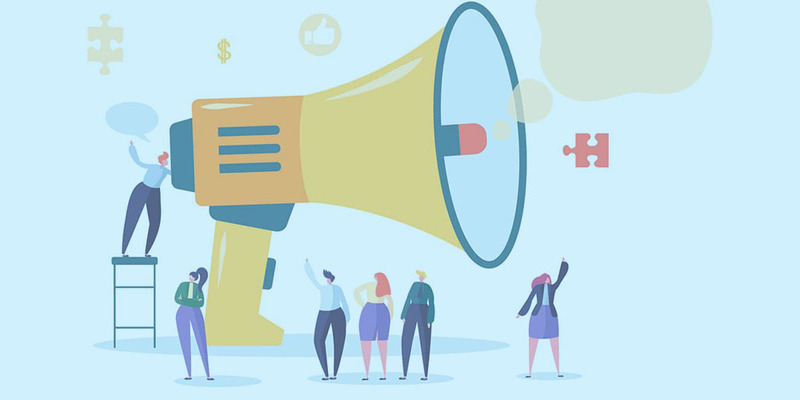 When you have the consumer wanting to know more information that you provide, that bring you one step closer to achieving your marketing efforts, whether acquiring a lead or customer retention. Paid-search & SEO (search engine optimization) is another valuable approach to inbound marketing. Google and other search engines have given people the power to search for anything they wish. This has shed light on a new digital era of marketing. Search engine optimization, in summary, is utilizing specific keywords to match what the audience might be searching for. This helps to rank the content that you are presenting to the right audience. Being able to track and analyze what is working and what isn’t is such a valuable tool for marketing professionals. When marketing your product or service through content, you want to rank higher than your competitors, so researching the right keywords makes your content either a hit, or at the bottom of the barrel in search results. Speaking of content, in this digital world, content is king. Or should I say, quality content is king. Inbound marketing relies heavily on content marketing and SEO. 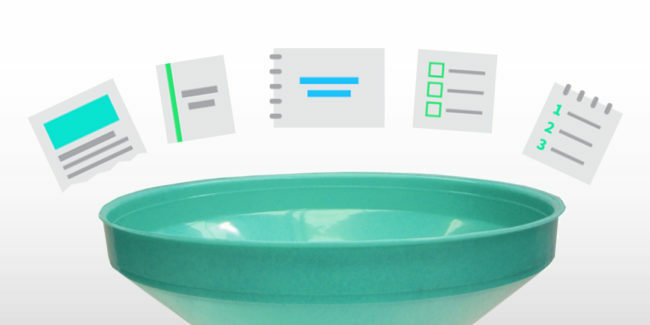 The goal of content marketing is to guide your audience through a funnel. The funnel consists of 4 main stages. 1) Attract 2) Convert 3) Close 4) Delight. You want them to be aware of what has been causing their “pain.” Once the audience understands the issue at hand, then they fall into a consideration stage, considering the product to solve their supposed solution. After they considered an approach to their supposed issue, then they are one step closer to transforming from a lead to a closed sale. 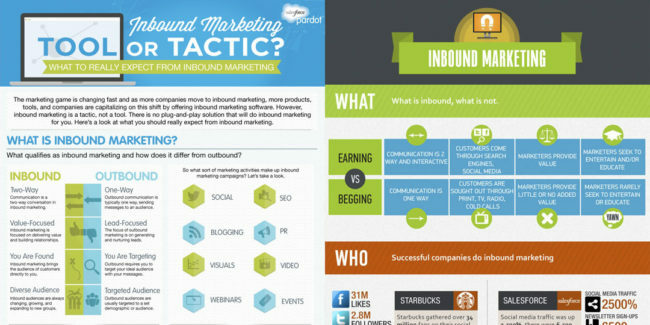 This is the basics of Inbound marketing through content and is a hot marketing approach in today’s digital era. Consumers like to do their own research now, so why not give them what they want! Provide the quality content they are looking for so that you can build trust between you and the consumer in order to transform them into a quality lead. It’s not about the amount of leads you have as a business, it’s about the quality of leads. Why? Because if you have a bunch of leads but no turnover, then those leads are basically worthless, and we don’t want that. Even if the group of quality leads are small, 1 or 2 that turnover into a paying customer just increased your business and effectiveness of your marketing efforts. As marketing professional, utilizing both outbound marketing with inbound marketing efforts will give you the well-roundedness you need to achieve your goals. Marketing requires creativity, and creativity requires different platforms to reach your audience in order to create the quality leads you need. Responsify is the all-in-one growth marketing solution that helps companies, large and small, to develop the right strategy, and attract, convert, and close their ideal customers through quality content. Responsify also provides support in producing Inbound content, nurturing email and social campaigns, giving you the necessary boost you need to gain more leads. To learn more about what is outbound and inbound marketing and how it can help you, reserve a time today and have a 1-on-1 chat with an inbound guru. We’re here to help!